The example demonstrates anchor panels. In this example the primary chart is configured to display a shape series with 5 data points (shapes). It also contains 5 anchored panels each containing an instance of a different bar chart. 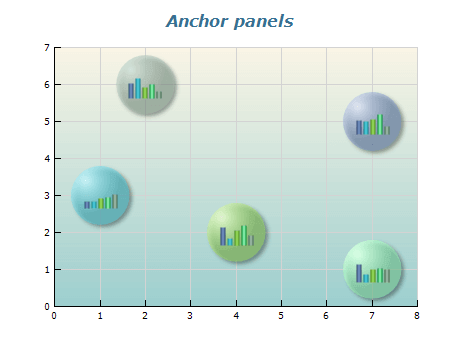 The anchor panels hosting the bar charts are anchored to the data points of the shape series (contained by the primary chart). The example demonstrates anchor panels. In this example the primary chart is configured to display a shape series with 5 data points (shapes). It also contains 5 anchored panels each containing an instance of a different pie chart. The anchor panels hosting the pie charts are anchored to the data points of the shape series (contained by the primary chart). Annotations are anchor panels that also posses an anchor (pivot) point. The anchor is calculated at runtime and depends on the position of the scene item to which the annotation is attached.